Be prepared to be enchanted and ready yourself to experience a whole new world of magic delivered with impeccability. 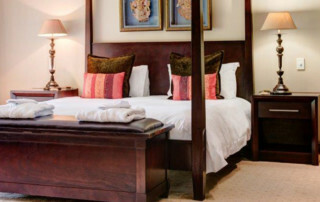 In the rolling hills of KwaZulu-Natal, fifteen minutes from the bustling city of Durban you will find the lush green village of Kloof, and at its heart, the Makaranga Garden Lodge complete with hotel, restaurant and wedding/conference facilities. No other place can boast a more wonderful setting for work and leisure guests, young and old, mobile and immobile, day visitors or long term stays. Rest assured you will be changed for the better for having experienced Makaranga. Thirty acres of indigenous and exotic botanical gardens, 18 ponds, meandering streams and a waterfall await your discovery and offer you their joy and healing. Experience the largest private collection of Zimbabwean stone art in Southern Africa as well as hand selected Italian sculptures. 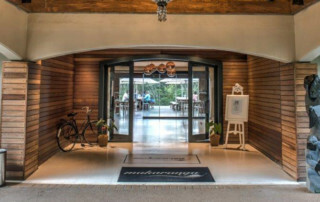 The interiors provide a visual feast of original art and décor making Makaranga a sensorial experience no matter the weather. 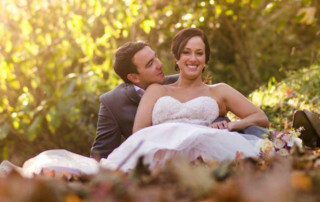 Makaranga is the ideal venue for elegant weddings or functions. 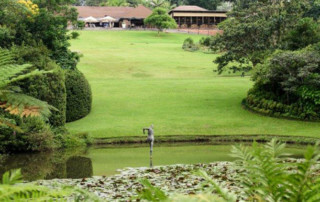 Wedding ceremonies can be held in the gardens, and the reception is held in the function venue, Sibeko, overlooking the gardens. As no two functions are the same, we invite couples to a site visit, by appointment, in order to discuss their particular needs for their special day – we have a number of packages on offer. Please contact our functions coordinator who will welcome the opportunity to assist you to plan and create your special day. We have a generator and a solar system to ensure your function will be uninterrupted in the event of a power outage.